If you want to use HTTPS with your Scala application based on Play Framework 2.3 (or lower), then it’s not possible to just enable this secure protocol in the configuration file, which you can do with the more recent Play versions. But, given that using HTTPS in today’s web applications is inescapable, how would you configure a Play 2.3 project to use this secure protocol? Redirect the users from HTTP to HTTPS in your application. We explain step by step how you can run a Scala application on HTTPS. Note, however, that we provide a solution that you can only use for development; if you decide to run a production application over HTTPS, you'll need to register your SSL key with a trusted Certificate Authority (CA) to get signed and approved certificates. Before we move further, let's also review the main terms related to HTTPS. To use HTTPS, a secure protocol, you need an SSL certificate and two SSL keys, which are all registered in a keystore on your computer. But what are they exactly? An SSL certificate is just a file that contains a unique cryptographic key — an SSL key (which we discuss further) — connected to your organization and also metadata about your company (its name, the email, and other data). Typically, you first create a self-signed certificate with a library such as keytool and use it for development and testing. Then, when you're ready to deploy your application for production, you can send your public key to a Certificate Authority for validation and then use the registered, valid certificate. You'll use two SSL keys. One key is called public and is sent to the users to be stored in their browser, encrypt their requests to the backend application, and validate your application as trusted. The other SSL key is called private and it can only be stored on the server where the application runs. Using these keys allows you to encrypt the information with one key and decrypt it only with the other key from the same key pair, thus ensuring that the user data looks gibberish to an attacker. A keystore (also called a key storage) is a file that contains a set of SSL keys used to authenticate HTTPS requests. This file also let's you manage the registered SSL certificates, and, therefore, keeping your keystore file in a secure place is vital for production applications. We use the keytool library to generate and manage SSL keys on Ubuntu 18.04 (you can use keytool in Windows once you install the Java JDK). Note again that the generated certificates and keys will only suitable for development mode — the SSL certificates that you create with keytool are called self-signed and they're not considered trusted by the browsers. You have to contact a Certificate Authority to verify and sign the public key to be used for production. A CA just signs your certificates thus making sure that they're authentic. When you get the signed certificates from a CA, you just need to register them in the keystore (we explain how you can do this in a later section) and run the application by specifying the updated keystore. -keysize 2048 sets the keystore size in bytes. The larger the storage, the more difficult it'll be to decipher an SSL key. Setting the keystore size to 2048 bytes is sufficient for high-level security. -genkeypair generates a public key and an associated private key. -alias tomcat sets the alias for the SSL key; you'll use this alias to reference keystore later, when configuring the application. -keypass 7fL8&8dcEB sets the keystore password to 7fL8&8dcEB. Memorize this password as you'll need it later to generate an SSL key. 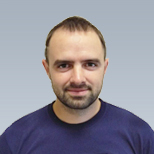 -keyalg RSA sets the encryption type for storage, which is RSA. When you run this command, we can give one recommendation — resist the temptation to use 123456 or qwerty for the password even for testing purposes. You need to enter a fully qualified domain name (FQDN), a host name, or a URL. There's no need to enter your real name, though. If you're creating a wildcard certificate that can be used with subdomains also, add an asterisk * in the left part of the name. For example, using the strings *.coolexample.com or www*.coolexample.com, you'll be able to protect all the subdomains with the same certificate. This is an optional field. Use it if your company's departments have their own SSL keys. For instance, you can enter IT. Enter the name of your organization. Note that the organization you provided must be the owner of the domain name that you specified previously. And if you're registering as an individual, provide your name. Provide the full name of the city where your organization is located or registered. Provide the full name of the state or province where your organization is located. You need to provide a two-letter code for the country where the organization is located. Enter UA for Ukraine, ZA for South Africa, IE for Ireland, or similar. You can consult the table of ISO alpha-2 codes for your country. Once you answered all the questions, the terminal will want you to confirm that the data is correct. Just enter yes (provided you're satisfied with what you entered). -certreq generates a public SSL key (which has also a fancy name Certificate Signing Request). 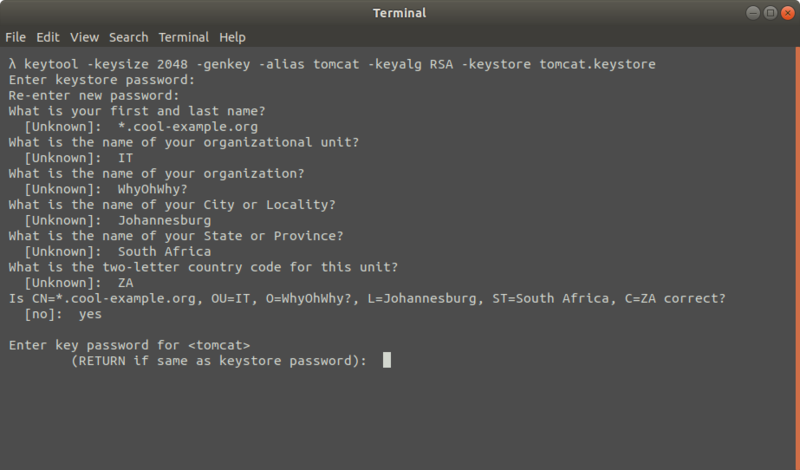 -alias tomcat sets the alias to refer to the key. -file csr.txt creates a csr.txt file to store the key (this is different from the keystore). -keystore tomcat.keystore sets the key storage file. You can skip this section if you're going to only test the HTTPS connection. However, if you're going to use the generated SSL key for production, you'll need to send it to a Certificate Authority. Just copy the SSL key that you can find in the home/johndoe/csr.txt file. Note that you must copy the entire contents of the file including the delimiters -----BEGIN NEW CERTIFICATE REQUEST----- and -----END NEW CERTIFICATE REQUEST-----. Without the delimiters, your key won't be valid. Your SSL provider will give you two certificates in exchange for the key — the root and the intermediary certificates. (These certificates are also called primary and secondary respectively.) You need to add them both into the keystore. -importcert tells the keytool library to import the certificates into storage. -alias secondary sets the alias for the intermediary certificate. -keystore tomcat.keystore sets the necessary keystore for the certificate. -file <path_to_intermediary_certificate>.<ext> sets the path to the file with the intermediary certificate. Remember to replace the <path_to_secondary_certificate> with the actual path; and also use the proper file extension instead of <ext>. Your keystore now stores all the necessary data to let you use HTTPS in your Play 2.3 application. The last step is to redirect requests coming from HTTP. Before you attempt to run your Play Framework application with HTTPS, you need to make sure that users, when visiting your website over an HTTP port, are still protected with HTTPS. And protecting the HTTP traffic is very simple. Our implementation of the onRouteRequest() method will filter all the client requests depending on the employed protocol (the req.secure property is a boolean value and it returns true for HTTPS and false for HTTP). If the req.secure is false in production mode, then the request came through HTTP, and we need to replace the protocol with HTTPS. As you can see, it's enough to just change the http:// part to https: in the request string. Notice that we don't need to replace the request string in development mode. This is when the second part of the method is useful. This is how your Play Framework-based Scala application can run with the secure HTTPS protocol.